By Rabbi Moses A. Birnbaum, D.D. 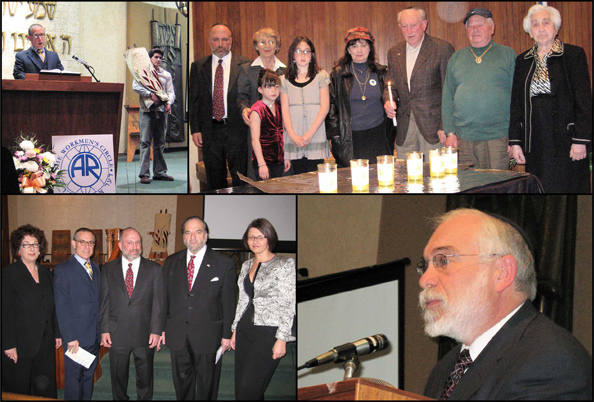 Some 200 Long Islanders recently gathered at the Plainview Jewish Center to remember and pay tribute to the martyrs of the Holocaust and the heroes of the Warsaw Ghetto Uprising. The night of April 30th marked the beginning of the 24-hour period designated by Israel’s parliament, the Knesset, as Yom Hashoah v’Hagevareh – the Holocaust and Heroism Day – which coincides, on the Jewish calendar, with the destruction of the Warsaw Ghetto in 1943, The congregation, partnered with the Workmen’s Circle/Arbeiter Ring to present an evening which focused dramatically on the relations between Jews and Poles, then and now. Joining the congregation’s clergy, Rabbi Moses A. Birnbaum and Cantor Morris Wolk, and lay chairpeople, Sanford and Nanette Strenger, were Consul Urzula Slazak of the Consulate of the Republic of Poland in New York, Adrienne Cooper, famed Yiddish singer and program director of the Workmen’s Circle, and Menachem Daum, a distinguished and pioneering filmmaker on Jewish themes. Both Consul Slazak and the rabbi highlighted the difficult questions that require thoughtful and informed answers in the dialogue between the two peoples, both custodians of parallel, yet different, narratives of victimization. The Consul, who was a teenager when Communism fell in Poland, grew up unaware of the rich Jewish life that existed in Poland before the Second World War. Judaism was a taboo subject and the few Jews left in Poland were ashamed, or in the case of the younger generation, ignorant of their backgrounds. In stark contrast, in today’s Poland, there is a growing interest, especially among the young, in the lost Jewish culture. The Republic of Poland has excellent relations with the State of Israel and is one of its foremost friends in the European Union. Trade between the two countries is significant and complementary. Ms. Cooper, accompanied by pianist, Dan Rosengard, presented several moving songs composed during the Holocaust period and delivered a stirring message in Yiddish and English, in remembrance of all the martyrs who perished in the "great prison" the Nazis created in Europe and especially focusing on the heroes of the Warsaw Ghetto Uprising, the 65th anniversary of which is observed this year. Mr. Daum screened excerpts from his film "Hiding and Seeking", which he both produced and directed. In it, the Daum family, descendants of survivors, travel together to Poland. The complicated relationships between Jews and Poles is explored honestly and dramatically. They meet a young woman who, spurning any reward, has decided to devote her academic life to the study of Polish Jewry. She organized the young people of her rural town to repair the Jewish cemetery that had lain for decades vandalized and in ruins. Most poignant, is the meeting of the Daum with a family which rescued one of its progenitors, solely out of a strong inner imperative to do what was right, even at great peril to themselves. Sadly, the Jewish beneficiary of their courageous behavior chose not to keep in touch or even send a letter of thanks. The cinematic pilgrimage of the descendants of those survivors becomes the beginning of a new chapter where the debt is finally acknowledged. An emotional highpoint of the evening was the kindling of six memorial candles by local survivors and their families. This was followed by the annual reading of the names of those martyrs inscribed in the congregation’s Book of Remembrance by those in attendance, sequentially. The rabbi and cantor then led all assembled in the memorial prayer. Upon leaving, one attendee was heard to remark, "Why on this night of all nights, was a representative of Poland invited?" She received a response that, indeed, that was in great measure the point of the program. The Jews, by inviting Polish participation and the Polish government, by responding both demonstrated their hope and commitment to greater understanding leading to better relations. This woman would have none of that. She explained, with great and justified emotion, that her family survived the war only to be killed in a pogrom perpetrated by Polish nationals in 1946. Some difficult questions can never truly be answered.